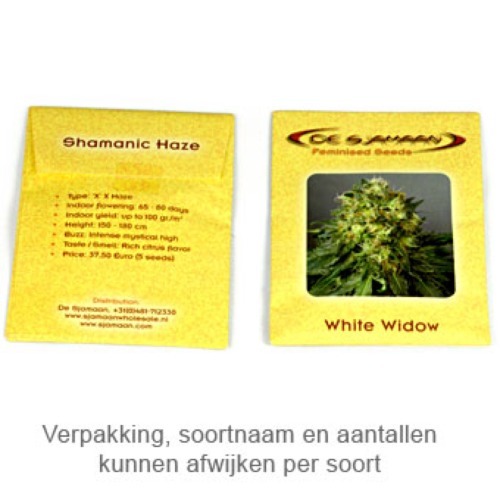 Intense Skunk from de Sjamaan are feminised cannabis seeds from a very nice old school Skunk. This weed plant is originated by crossing a Skunk x Afghani Hash. De Sjamaan Intense Skunk are cannabis plants that are popular by both commercial growers and people that just grow at home. These plants are very stable and produce each time plants with the same height and yield. The effect of smoking this weed is very powerful, therefore this strain is not suitable for smokers with less experience. Growing cannabis from these feminised cannabis seeds provide you a powerful Skunk that you can buy in almost every coffee shop. Tell us and our customers what you think of the Intense Skunk from De Sjamaan.